Give your car a "Birthday Party"
The CIMS number is very important: Include it to reach the correct department. Also send the serial number and model of your Dodge along with a check for $45.00 payable to Daimler Chrysler. It’s nice to have the factory-origin records of your car. It makes ownership more meaningful to us and to future owners. Ed note: We believe this applies only to 1928 and later vehicles. We have seen records as early as for a 1928 Victory Six. If Chrysler can go back further than this, someone write to your editor and advise otherwise Ed. One of four sides of original documents a bit larger than 5x5-in. that were photocopied for Bob for $35. The quality is not great, but we see that Brother Berres was advised the original engine number, body number, body style, and key number for his car. 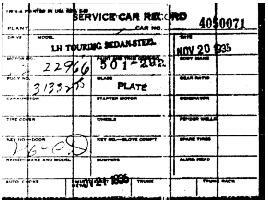 His LH touring sedan was built on November 20, 1935 and went to Otto Brothers dealership, St Cloud Minn. Paint and trim code were 501-292. 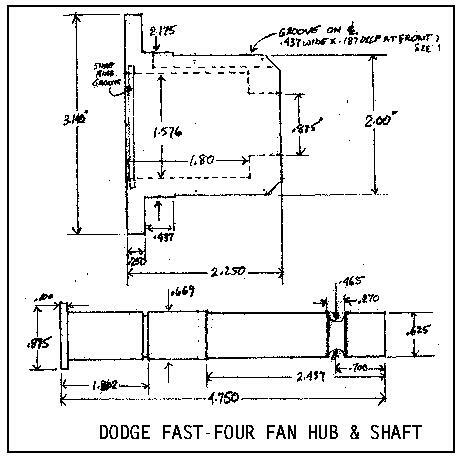 The original fan hub used on the Fast Four consists of a stamped steel pulley and an inner die-cast zinc (pot metal) housing that serves as an oil reservoir, gear pump, and bearing. This original design was a clever arrangement, but it's usually found to be in unserviceable condition due to wear and/or deterioration of the pot metal. 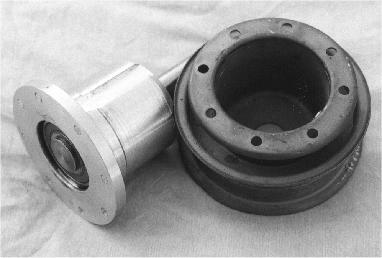 The drawing and photos show a simple replacement hub and shaft that use modern ball bearings to replace the old pot-metal unit. The new hub design will not compromise the look of the original unit and can be turned from a piece of aluminum. The drawing shows all critical dimensions. The groove at the front of the hub bore is for a 1.625-in. OD inside snap ring that retains the bearing and shaft assembly. 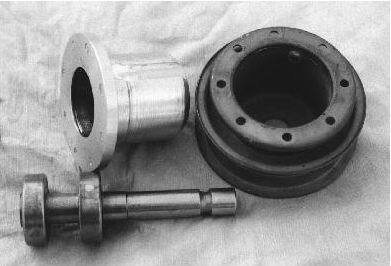 To retain the original oil fill screw, the threaded ferrule on the inside of the pulley cup must be shortened. The screw can then be soldered into place from the inside. The 0.437-in. wide groove milled on the outside of the bearing housing provides clearance for the shortened threaded ferrule. It will also serve to index the fan blade mounting holes. The 45 degree chamfer at the rear clears the rounded back of the pulley housing. The shaft is turned from a piece of drill rod or other suitable stock. A 0.625-in. snap ring keeps the rear bearing from moving forward. Two 6203 sealed bearings are used. They will press onto the 0.669-in. shaft and tap gently into the housing. Because the screw holes are not symmetrically spaced, it is easiest to use the pulley as a drill guide for the fan attaching screws. and ready to go into the original fan hub, right.